The Museum of political history was the first historical revolutionary museum in Russia. It was created in 1919. The Museum houses a unique collection, numbering over 450 thousand exhibits, reflecting the main milestones and events in the history of Russia of the 19th and 20th centuries. Among them – a collection of revolutionary banners from 1917, an extensive collections of political posters, propaganda porcelain, as well as documents, leaflets, photographs, paintings and sculpture, personal belongings of famous political and public figures. In 2007, the State Museum of Political History of Russia had celebrated 100 years of it’s collections. The museum is located in the historic city center and is housed in two mansions built in the early twentieth century. One of them – a mansion of prima ballerina of the Mariinsky Theatre Matilda Kshesinskaia – the pearl of the St. Petersburg Art Nouveau (architect A.I.fon Gauguin). In 1917, this building housed the headquarters of the revolutionary Bolsheviks. It was often visited by Lenin, Stalin, Zinoviev, Sverdlov and other important politics. 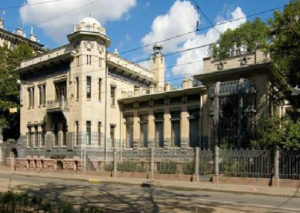 The second mansion, built in 1909 for a large lumber baron V. E. Brandt (architect R. F. Melzer), also belongs to the historical and architectural monuments of St. Petersburg. The focus of exhibitions of the museum is the main political, economic and cultural transformations of 19th and 20th centuries, the crucial stages of the history of Russia, which predetermined it’s fate. This excursion will allow you to discover unexpected sides of our common historical destiny, biographies of prominent Russian politicians, reformers and revolutionaries, emperors, and party leaders. This excursion is not available on Thursdays.